I should have asked him how long it had taken him and if it required any programming. I have later learned from working on “The Moonmachine”, that everything takes time, and that you almost never can do something ALL by yourself. Yes, it has taken quite a while to make my book, but nevertheless, it has been a great experience and a lot of fun working on the project! When I graduated my bachelor at The Animation Workshop in Febuary 2012, I knew that I had to start making a project which could fill the holes of my job as a freelance artist in Denmark. I choose to make the interactive children’s book, as I thought it would be the easiest and quickest project of my pile of ideas. But who was he? Where did he live? What was his mission? 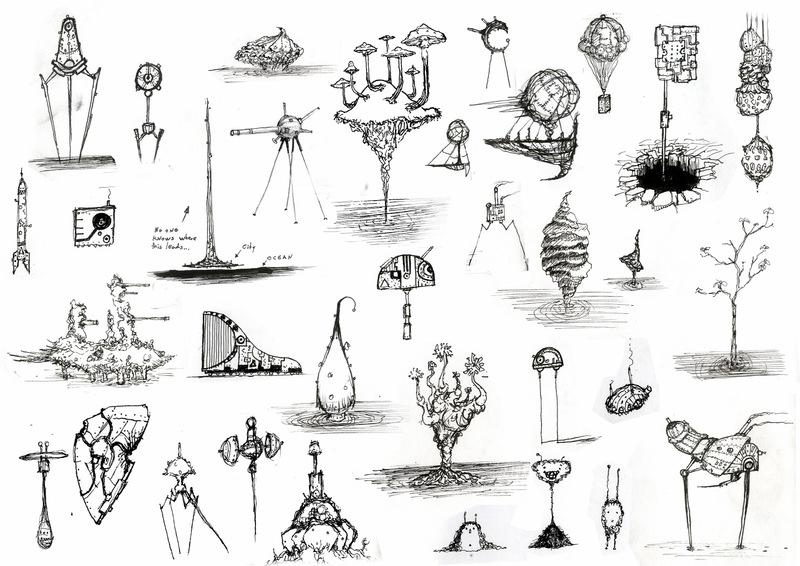 To answer all these questions, I started drawing small sketches of a world and of the little guy in different situations. My main inspiration for this was drawn from the artist Shaun Tan, who is extremely good at inventing objects and creatures with great shape language that look completely foreign, but still feel very familiar. 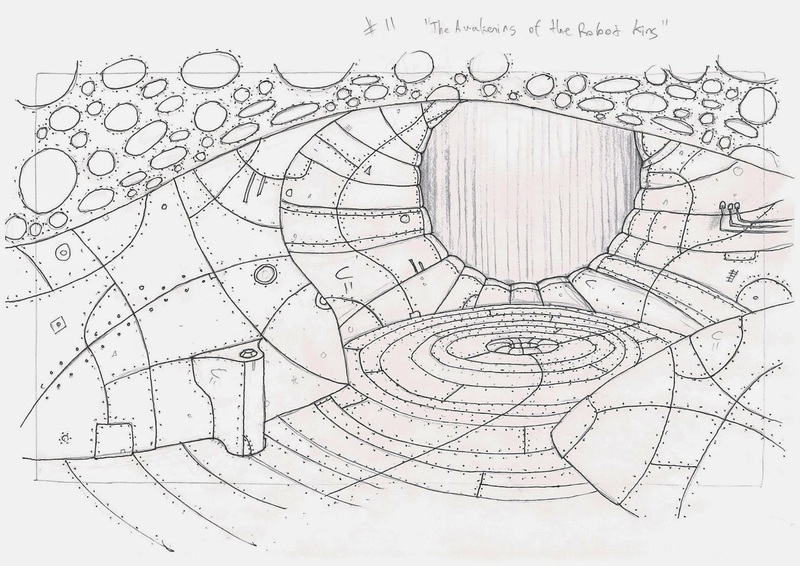 When I made the drawing of the rocket reaching out of the cave, I felt a story emerging. The little guy wanted to travel to the moon! But why not make it a moonmachine? 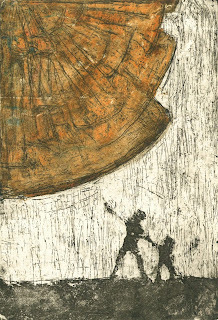 Back in 2009, I had done an etching of a sunmachine, inspired by the song “Memory of a Free Festival” by David Bowie. I always wanted to use this sunmachine in a project, and now I had the chance to do so. Now I was ready to write my story. - A little forest gnome is dreaming of going to the moon machine above him. - Machine parts suddenly falls down in his forest and he collects them. - By using the parts, he builds a rocket and flies to the moon machine. - He crashes, breaking his rocket into five pieces which he must find. - He becomes friends with a robot pig. - They are captured by the evil robots, but escape. - After finding the last rocket part, he travels home with his new friend. Except from the key plot (where the Moonmachine breaks down and needs to be fixed to become the Sunmachine again) the story was pretty much there in the first go. Strangely, it took me awhile to come up with that idea - which would become the main story. I already had the idea that Sofus could build and fix things. So it seemed quite fitting that the Moonmachine would break down. I also needed a legit reason for him to travel all the way up there. Then, of course, I turned it into a Sunmachine in daytime, so when it would breakdown, it would create eternal night and threaten the forest. All of a sudden I had created a classic morality based, tree hugging, hippie tale. 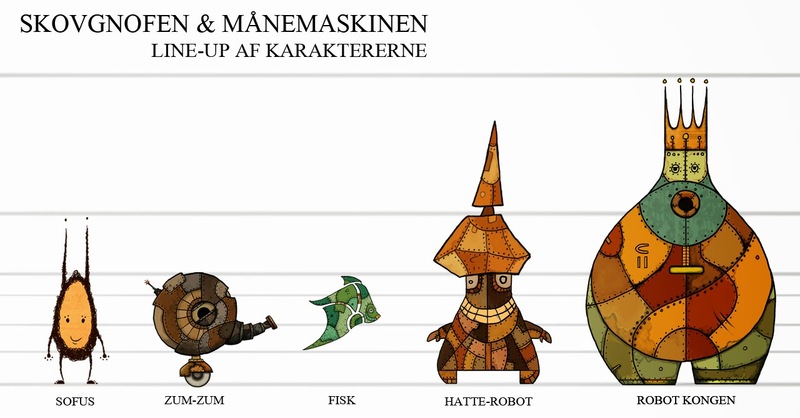 Why not enlighten our children using robots and creatures from the forest? Well.. I went with the story and am still happy with it. I gathered reference and started figuring out the look of the forest planet and the Moonmachine. For the home planet of Sofus I looked at the Swedish illustrator John Bauer. I really like the way he uses graphical shapes together with rich patterns. Also, his gnarly universe is close to that of the planet, which, btw. I named Goya after the Spanish artist. 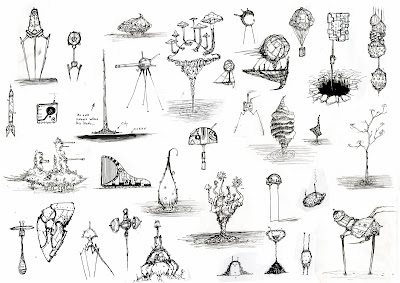 For the Moonmachine, I mainly looked at the game Machinarium, which has kind of the same design language as Shaun Tan, which I spoke of earlier. If you look at the backgrounds of Machinarium, you will clearly see the rough hand drawn line of the artist. This makes the backgrounds very organic and alive. 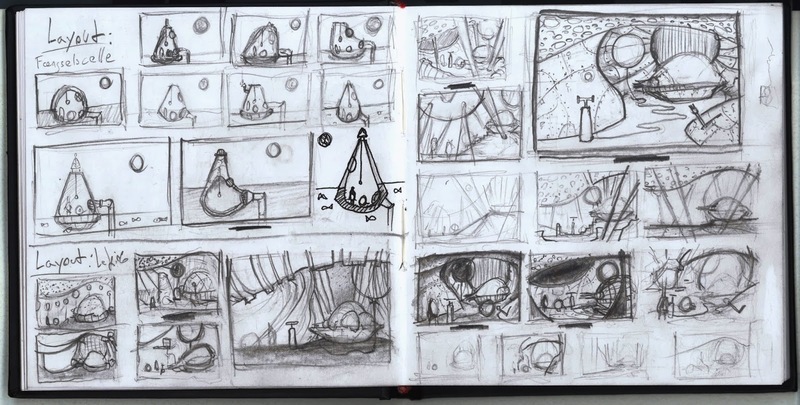 Also, my line is very rough and similar to the style of Machinarium, so when I first played the game, I thought “hey – my drawings would actually work great in a game like this”. The reason I started drawing in this style came from playing the Lucas Arts point-and-click adventure games in my childhood. 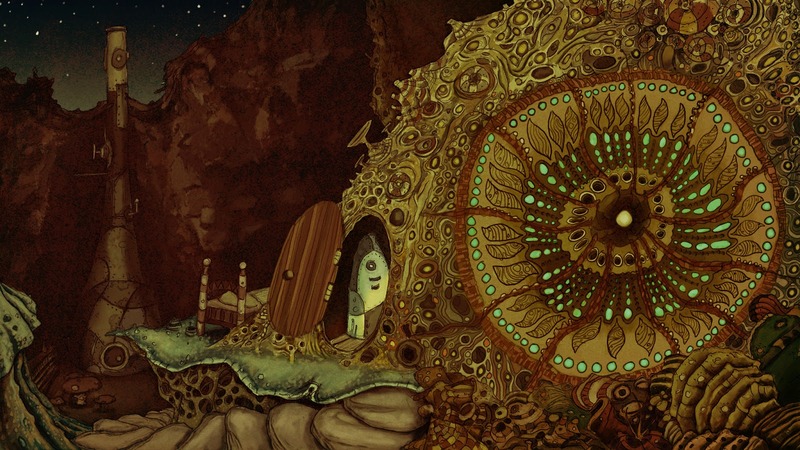 The Moonmachine is heavily inspired from games like Monkey Island 2, which totally blew my 10 year old mind. The music and backgrounds of the game created an atmosphere that got me sitting in front of the screen for hours, drooling. Fate would have it, that concept artist and illustrator Peter Chan (who worked on all these awesome games) would later come and teach my class at school. So I actually came to learn directly from my main childhood inspiration – far out and pretty awesome? Yes. When I had my universe set up in my head, it was time to make a “proof of concept” which would dictate the style of the book. I went for a key point in my story: Sofus crawls into the rocket which is sticking out of his cave and pointing at the Moonmachine. Preparing for blast off. First I made the hand drawn sketch on a A4 size paper. I wanted to do a sketch first and then do fine line work on top, but the roughness of the “first take” fitted with the style I was going for. So I took my pen and drew the line work directly on the pencil sketch. Afterwards I scanned it in and painted it in on my laptop, using a simple Wacom tablet. The painting went quite fast. 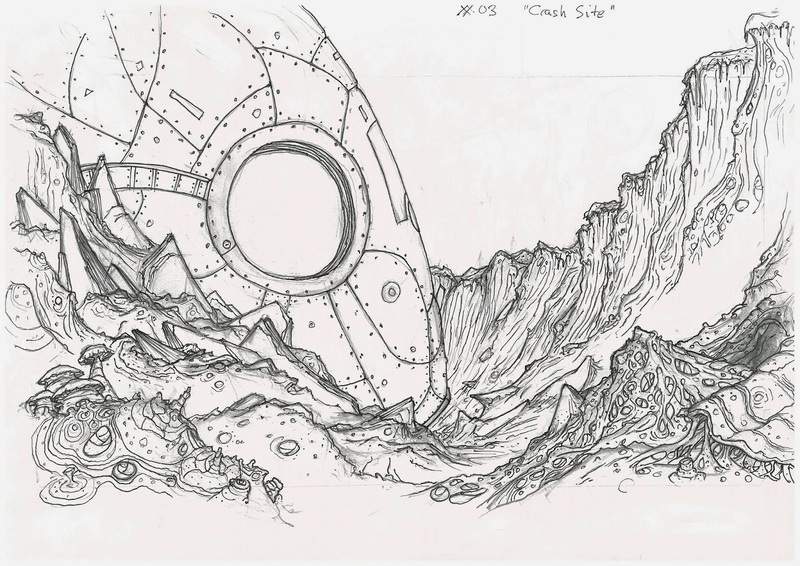 You get a lot of cool textures and strange shapes when scanning in pencil drawings. I basically just had to block out the different areas, then color correct and finally paint details here and there. I had my story outline and my art style. But how the hell would I put it together, once I had all the assets? “It should be easy to find some software”, I thought. But no – there was no easy solution. I had to find a guy that could code the whole deal. I asked my friend from the animation school if he was up for it. He said yes and then we were a team. Surprisingly, the task was bigger than any of us had imagined, so sadly he didn’t manage to get enough time to finish it. But for that whole year, I concentrated on the creative side of the book and didn’t worry about programming. I tried planning the whole production and my first guess was way off. I thought everything, including backgrounds, characters, simple animation (at the time), sfx/music, programming and text, would take three months in total. Time that with three, and that is not even the final production time. But let’s not forget that the project grew larger with time. Also going on/off a project makes it harder to keep concentration and speed. But I sharpened my pencil and was more than ready to take the challenge. What I like about point-and-click-adventure games is that you get to explore the world and meet strange characters. I wanted the scenes on the Moonmachine to feel like this kind of journey. To create an overview of the different scenes, I made what I call a “page bible”. This document described the story, actions, sounds and interactivity of each of the scenes. The different scenes were actually constructed from an interactive perspective as I wished to explore what the tablet devices could offer. In retrospective, I should probably have focused on the story before interactivity, as the story is more important. But I managed to make my story work nonetheless. Some of the scenes are completely based on an interactive gimmick like “shake the tablet to shake down the missing rocket piece” or “turn the tablet to steer the rocket”. Other times I just added interactivity to spice up the scene. As I came up with plots and characters, I did some more concept sketches. As you see below, I had a hard time figuring out what Sofus (Sylvester was his name back then) looked like from the side. He still looks pretty dumb from the side, but hey – a dumb look can be charming. I had to make Sofus stick out from the rest as he is from another planet than the robots. My approach to designing the robots was very playful, as they are made out of lines going in and out of each other like a kids drawing. 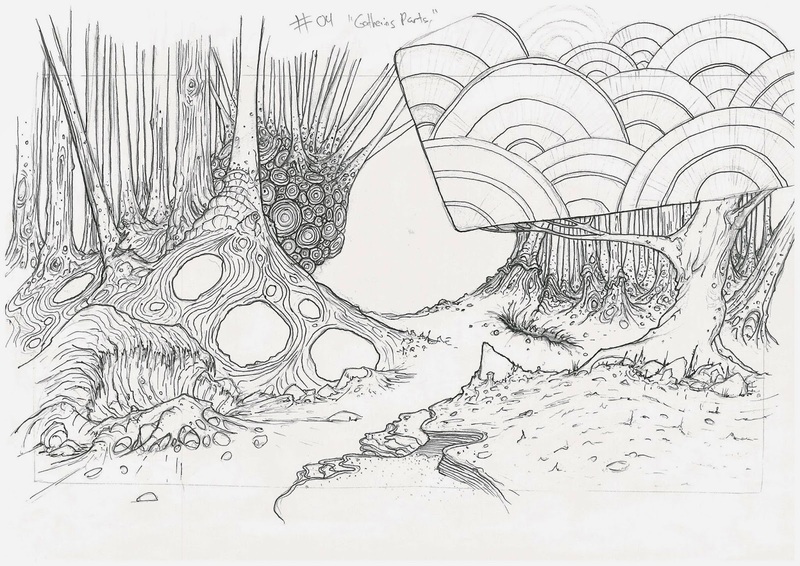 Before I moved on and designed the backgrounds, I trashed two scenes. One in which you helped Sofus prepare the journey and another scene in which Sofus had to help an old lady with dementia tidy up her home. 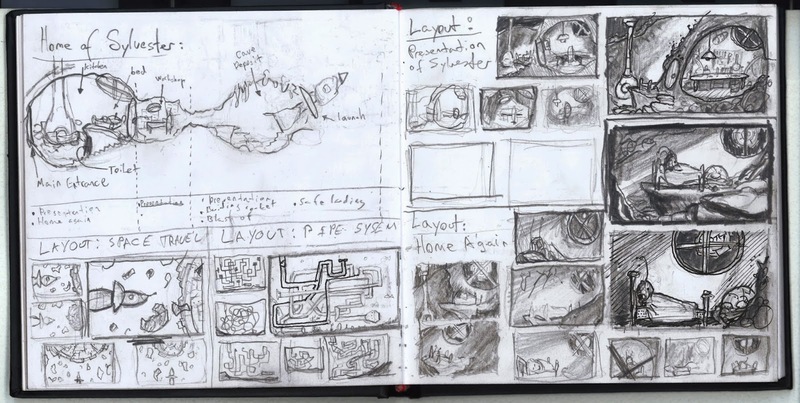 Now I had 18 scenes which needed to be designed, so I went on to make a bunch of thumbnails of the different layouts. Now that I had the scenes in order, I started writing a basic text for each of the scenes, including dialogue and narration. I quickly found out that the story was much bigger than I first intended it to be. The project had grown in size, but the story would suffer if cut it down any further. I still needed to find out just how long the story was, so by using the layouts and quick animated doodles on top, I made an animatic. After watching the animatic, I concluded that you can't read the whole story in one go, so i divided the story into 3 acts. Preproduction was done and it was time to move into the production of the actual assets. The first task was to make the backgrounds for each of the 18 pages. My thought was to spend 3 days per background (fully painted). This time, with much satisfaction, my calculations turned out to be true. I created some depth in this background. By keeping the wreck in the foreground and placing Sofus looking down, small and disconnected, in the background, I created some mystery to the scene. To emphasize this, a critter will be crawling out the whole in the wreck, up to its nest (to the right) and observe its strange new neighbor. I always think of shape language first, when I design. This forest is designed with a mixture of known and unknown shapes to give it a foreign feel, but still communicating “forest”. 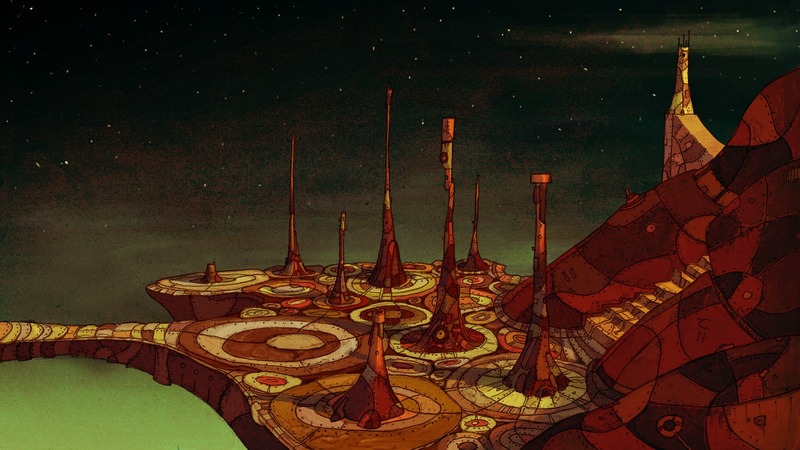 The strange white circles, to the left, are meant to house some animated plants which were made later in the production. This scene will show a rocket crashing in the foreground, Zum-Zum coming to the rescue and the first, and only, look at the skyline of the moonmachine. So a viewpoint with a slope (to make the Zum-Zum animation easier) did the trick. I designed the moonmachine in an organic way to keep a similar look to the forestplanet. This interior design of the Kings bedchamber looks pretty empty as most of the objects are animated assets that had to be created later in their own layer. The room is one of the more “minimalistic” of the backgrounds. The room is made out a few big shapes instead of many small. Each shape is still filled divided into smaller shapes and details, but they are contained within the larger shapes to make it more simple and clear. This background is very inspired by H. R. Gigers work (who says you can’t have biomechanical design in a children’s book?). The way the organic shapes “pushes” each other, creates a wonky floor which underlines the behavior of the crazy robot that jumps around on this spot. It is probably hard to notice, but the tower in the top right corner is actually the kings minimalistic castle. When I was done with all the drawings, I scanned them and painted them using a simple Wacom tablet. Below is the painted version. To finish each background, I needed to make the animatable layers, which would be made 100% digital. I will cover that in the next chapter. -One month forward, a couple of months back. Digital and interactive children’s books normally require a lot more money than the classic printed children’s book. Programming is required. Sound effects, voice narration and music are essential parts to the experience. Interactive design is also quite dominant and so is animation. All these lovely features, which make the digital interactive book stand out from the printed one, are also what makes the budget rise. Funding was new to me on the Moonmachine project. I knew we needed capital to complete the book, but how much? Programming had turned out to be a hard task and we could use some help. Neither the programmer nor I, were trained animators so we needed to hire an animator as well. And in the end, we were spending a lot of time on the project ourselves, so we could not really afford to keep going without some kind of income. We tried sending applications to 3 different funds, but were turned down by each one. We even tried to enter a Danish interactive children’s book competition, but sadly, we did not win. At last we got funded by ANIS (Animationssammenslutningen). We got 25.000 kr. which was enough to pay one guy a one month salary. Of course this was not nearly enough to cover the whole budget (which is probably around 350.000 kr. ), but it was a good start. We were unaware of the money until half a year later though..
We also got a deal with Open Workshop -a creative development center, which is a part of the animation school in Viborg. In a 4 week period, they offered us a place to live and work, surrounded by other creative people. We quickly set up meetings with programmers and people from the gaming communities. These meetings turned out to be extremely important for the production. Basically we realized that our approach with the programming was much too big a task. Our plan had been to program everything from the bottom up. A similar approach had taken a group of people from Open Workshop over half a year and was nothing near completion. The conclusion was that this was an impossible task - all our code was dumped and we had to find a framework to build on. We played around with both Cocos 2D and Starling, before settling with Starling. Besides drinking whiskey and playing board games with the other captives of Open Worksop, we worked hard and dedicated in those 4 weeks. And for the first time - side by side, which, not surprisingly, was important as we could bounce off ideas and make sure we were on the right track. The book still needed a textbox which would contain the dialogue and narrative of the book. I designed a box that fitted into the lower part of the screen. As the iPad is in a 4:3 aspect ratio, and I made the illustrations in 16:9, the rest of the space is used by the textbox. To fit this UI design with the rest of the world, I combined nature with machine – wood and mechanical buttons. Although there are not many player configurations to be made in the book, it still needed an option of switching music and narration on/off. Also it would be nice if the user could jump to his/her favorite chapter. My initial thought was to include it in some sort of title page in the very beginning of the book. Instead I included it as a part of the UI in the bottom so the user would have constant access to the options. All in all, we had good progress in those weeks and learned some important lessons. Still the programming task was quite big so we needed help. The problem was that it was a one man job. Many were afraid it would be to complex to collaborate on the same code. Some companies offered to make the app, required that gave we away most of the income percentage plus the rights to own the book. We chose wisely – even though the book would have been done now, giving away everything would just be plain stupid. In the end, my friend ran out of time and sadly had to leave the project. One and a half year had gone since I started the project and I was still missing all the code. I needed a team. So my search began. - - Next rhymes with text. I still had no money. Finding a coder, who would work without salary, is hard when you don’t know any. And it’s also difficult to judge a programmer’s capabilities when you know close to zero about coding. But at last I found a way. I wrote the job description on a Danish gaming forum, and fairly quickly, I got mails from people interested in the task. I decided on one guy, and the programming started anew. The backgrounds and all the assets were done, and the coding had begun. But there was still something missing. The text! As it is a book, it must have text… I concluded. But in what style should it be written? I had no idea. Well, maybe I had an idea.. but it was vague. I decided to go to the public library and rent all the cool looking children’s books with the same age group as mine (4-9 years old). I began reading and studying the language and the different styles. Some were written with large chunks of text and some had a single line per illustration. Others were written in small rhyming verses. I found these to be quite playful and fitting for my book, so I went with the verses. Looking back, I can easily say that I underestimated the skills required to make a good rhyming verse. And also how much time it takes to write. I had set aside 2 weeks to write, but it ended up taking close to 5! And then I had to translate it to English afterwards. Which almost took as long, as you can’t translate rhymes directly. The art of making a good verse is rhythm. I will be honest and say that I did not have time to master it, so the verses have become a little clumsy, but hey, so is the general feel and style of this book. Here is an example of one of the verses, in both the Danish and English version (note that it has not been edited, so it might change). ”Wow!”, udbrød Sofus, da han så, hvad der var sket. var der mon nogen gemt inde i vraget? ”Wow!”, shouted Sofus, when he saw the source of the crash. Deep down a massive hole was a big piece of scrap. Was someone inside the wreck? Was it a trap? As you can see, I choose four lines of text for each verse. And a A,A,B,B rhyme composition. There is something nice about having little text at a time. This way, the child knows that the story will move on in a moment. Also, the older children will be able to follow the text as it is being read out loud. Telling the story with rhymes gives a playful feel, and furthermore helps to remember the story, in the same way you remember songs. Around 100 verses went into the book, which meant 200 rhymes. Besides that, I wanted each of the 400 lines to have exactly 12 syllables. Probably why it took me so long! I later found out that it worked better with different syllables (but keeping it around 10-13 per line). As I am writing this, I still need someone to look through the English version, before I give it to a voice actor. So I’m not even done yet. Next chapter will cover the rigging and animation of the characters. 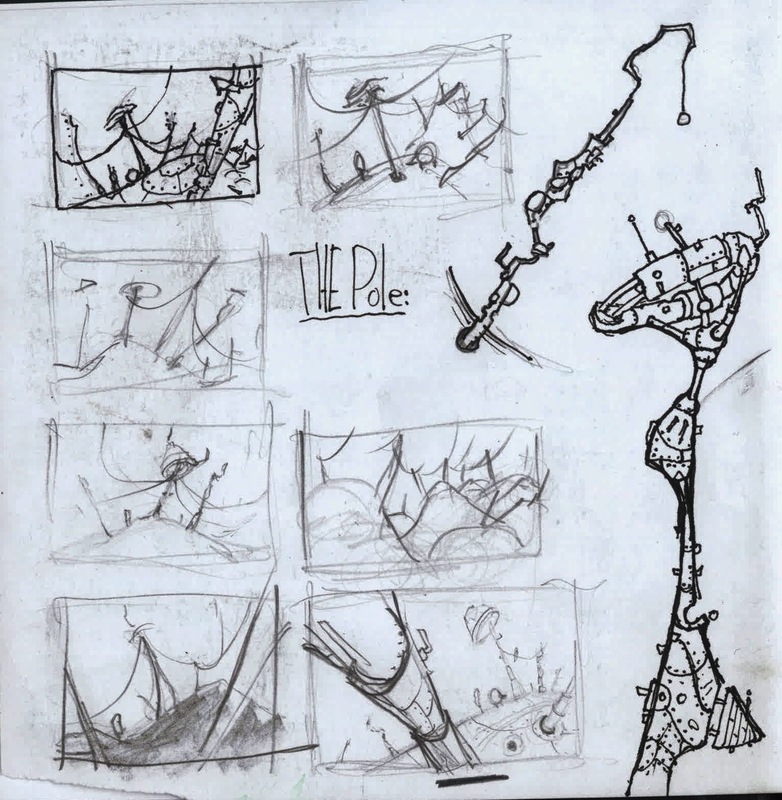 In the beginning, the idea was to have as little animation as possible. I had no training in animation and could not afford an animator, so limited animation was the way to go. 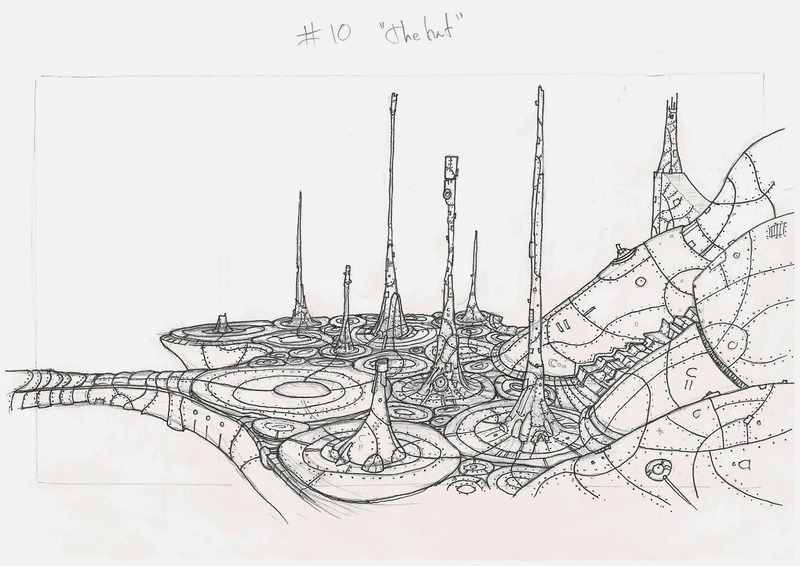 The plan was to have each character drawn as a flat object which jittered when pushed. Of course, as time went by, this style was a little too plain for my taste. So I decided to make the book fully animated. ANIS – Animationssammenslutningen (The Danish Animation Sociaty) helped me make this happen. ANIS supported the project with enough money to pay an animator for six weeks. I teamed up with one of my animator friends from my school and began working. As he also lives in Copenhagen, we worked together at his apartment. rest of the world. So I was happy to work side by side with a human being once again. 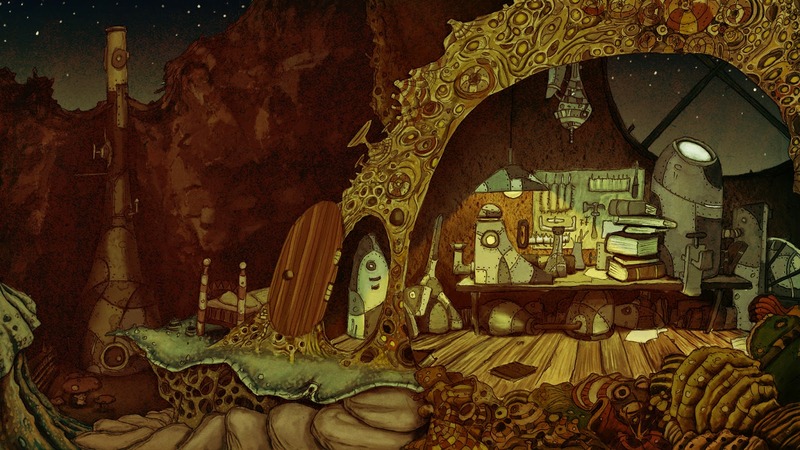 We chose the animation style to be digital cut-out-animation (like South Park, or Machinarium). To make the characters come to life, we needed to rig them first. This required that I re-painted each character and separated their limbs into different layers as shown below. I also drew some new secondary characters: a fly, random fish, a strange flying creature and a crawling critter. After this, the character models were rigged in Flash and then the animation could begin. Most of the scenes required the same animations, so we decided to animate the characters in the same way as you animate characters for a game. A walk, a run, idle animations and so on. And then there were all the unique animations on top, plus all the environment animations. All in all, it counted 70+ animations. So we needed a smart way make them. We made a six week plan and followed it pretty strictly, forcing us reach the deadline in time. It worked out really well. You easily get caught up in details when you animate, so it was very satisfying to just run through everything with an “I-can-see-what-the-character-does-so-that-means-its-done” attitude. We just went back later to polish off what needed to be polished. And, in fact, that wasn’t much. Of course, when you animate for a high budget animation film/game (or a project where animation is in focus), a high level animation is important. In this book, I judge it to be less important. One reason is that the digital children’s books usually have low animation quality, so the kids are used to that style/look. Another reason is that the simple animations fit nicely with the style. The characters are more like puppets on a stage, than dynamic characters seen in an animated film. When everything was animated, each animation had to be implemented into the scenes. This took much longer than expected. I almost think it had been quicker animate it directly into the scene, instead of doing it the way we did. But we did get all the characters animated within six weeks, and it turned out exactly the way we wanted. 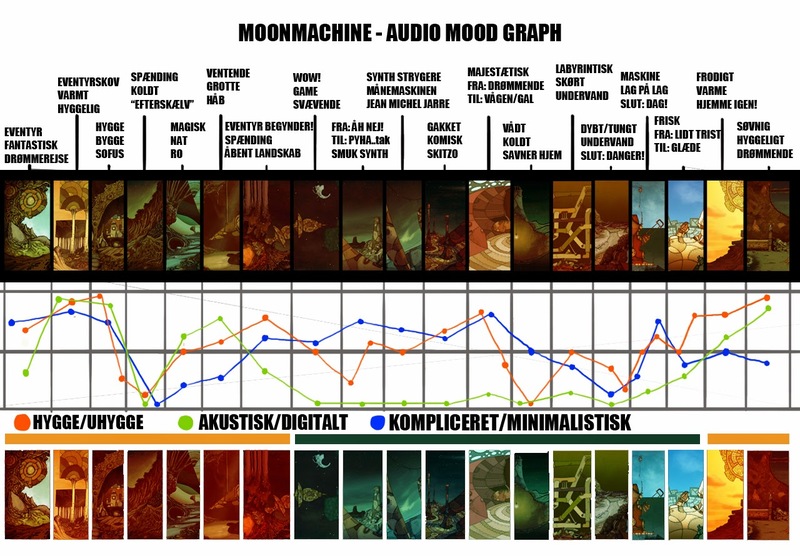 I always imagined the soundtrack of the game to be in different styles, like Peter McConnell’s work in Tim Schafer’s games. It’s a difficult task to create diverse pieces of music which still feel like they come from the same universe. I hope we found a satisfying balance between the diversity of genre and the unity of sound design. One and a half years into production, I began making music sketches on my iPad. Whenever I was travelling or had a quick idea, I would record small tunes in Garage Band. I would later take these sketches and record them properly. Some of these sessions ended up in the final book. Later I came in contact with a sound designer, with whom I continued to write and record the music. We worked in very short sessions, so our process had to be fast. Sometimes the powers of creation would be against us, and we went out with close to nothing, and other times we made 3 good songs in one session. I find music very hard to describe without using references, but I made an attempt to show it visually. Below is a mood board which describes the thoughts behind each scene in the book. It is in danish, so I will just translate the curves: Red: Cosy/scary, Green: Accustic/Digital, Blue: Complex/Minimalistic. Some of these thoughts/emotions have changed in the final pieces! Besides Peter McConnell, the inspiration behind the music mainly comes from the Final Fantasy series (Nobuo Uematsu), Zelda series (Koji Kondo) and Jean Michel Jarre. These artist all share a kind of “cheesiness” which I think is very charming. Especially when you are describing big feelings, this type of overly felt music can make a scene extra magical. Even though it might be TOO much, you allow yourself to be swept away by the sound wave that washes over you. In the track “Presentation of Sofus” we try to describe the warm and cozy home of Sofus. Whenever you visit a home or a small village in the old Final Fantasy games, this kind of soft vibe is always present. “Blast Off” is the sound of adventure! Sofus is ready to fly off into space, so why not underline this with a dreamy hero theme in the style of Giorgio Moroders theme in “The Neverending Story”? 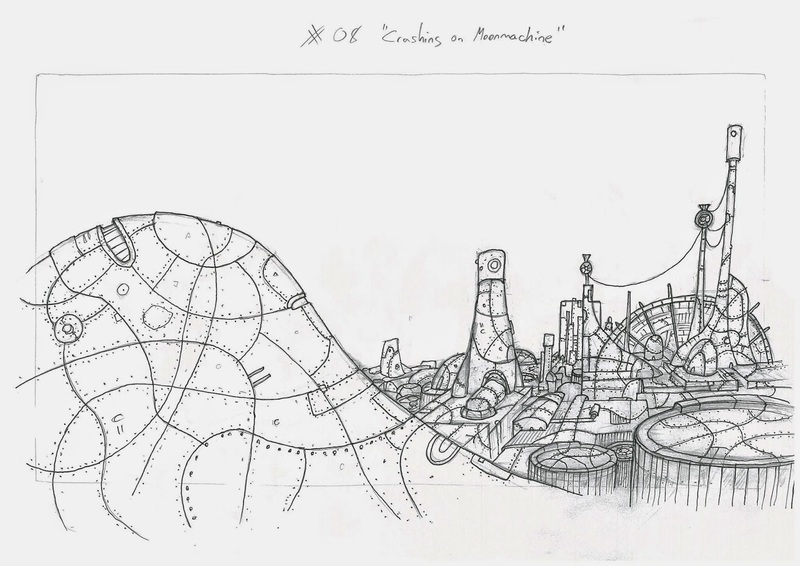 In “Crashing on The Moonmachine” the sounds should be describing a terrible accident as well as presenting the metropolis of The Moonmachine. We hear aircrafts flying by while a slightly oriental synth pushes in and out of the otherwise desperate theme in the background. The sound effects are a mix of real sounds found in sound libraries, and synth sounds which we made ourselves. The sounds of Zum-Zum are a mix of synth and our own voices modulated. He is aimed to be somewhere in between R2-D2 and Wall-E. Narration is very important in a storybook like this. For a long time, I considered using myself and my friends as the different voices, but at one point I decided to go with one voice for all characters. And I realized just how important the part was, so finally I ended up contacting the Danish actor Lars Knutzon. Fortunately he said yes, so we arranged 2 days of recording in a studio. I directed Lars while the sound designer recorded and made sure all the technical things were set up correctly. I could not have done this alone - this is definitely a two man job. It needs to go fast, and everything technical needs to go smooth. Talking for hours is very hard for the voice actor, so you don’t get the luxury of having many takes of each sentence. We normally did around two takes per verse, but not more than four takes. So listening and directing requires your full attention. Everything went smooth, and the result was awesome. I feel a great relief is coming soon, as the final pieces begin falling into place. In the next chapter I will write about polishing and wrapping up the project. - The last “5 percent”. Finishing a project always requires a lot more time than you think. If you do not have all the small things in order, the user will be annoyed or in the worst case the product will simply not work properly. The last 5% of a product sometimes take 20% of the entire production time. And you will always be surprised by an unseen error when you are dealing with code. As the previous programmers discovered, the job of coding this children’s book is a bigger task than first realized. Especially when it comes to optimizing the app to run flawless on anything below the newest iPad. We were just about to send it to testers when we realized that it kept crashing after a couple of scenes. The app was simply layering memory from the previous scenes. As we never tested the full app from a-z before now, the discovery was of course catastrophic. We did a lot of fixes to optimize the performance, so now it works much better. Other issues included buttons not being responsive. If a user is told to swipe something and it doesn’t do anything when you swipe, then you get frustrated. Also, there were verses of text which didn’t fit with the voice, or needed correction. Sometimes a swipe animation was going the wrong direction or Sofus didn’t blink in his idle state and so on. Little things that needs to be fixed in order to make the book 100% done. Of course you can keep polishing your product in all eternity and we don’t want to be doing that. But some errors need to be corrected before we, and the users are satisfied. I also spend a lot of time typing in actions for the events. Every scene in the book has actions which are triggered by the user. That means, when Sofus asks the user to open the door, the animation will be on pause until the user taps on the door to open it. Actions like these are written in the code. The same sort of code goes in when the player taps on “next-arrow” to hear the next verse. The programmer set up a system that allowed me to write actions directly in the timeline of the different scenes. This is also how the sound effects were timed and implemented in the scenes. Choosing the right fonts are also very important in wrapping up your product. I have never had that much training in fonts or any minimalistic graphic design, so I hope I chose wisely. We also set up a guide system for the user. The “next” button will be locked until you solve a puzzle, but in case the puzzle gets too hard, a “swipe” or “push” animation will play. 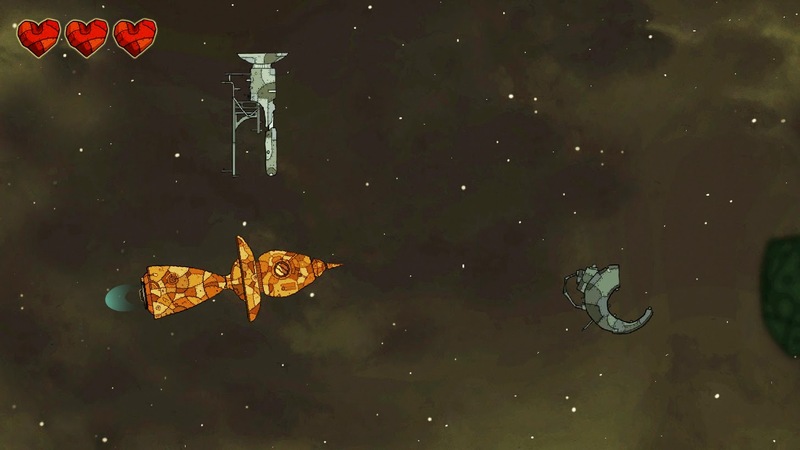 There are not too many puzzles throughout story, as it is not a game, but a book. Nevertheless, we put in small “puzzles” here and there. There are even two mini games in the book: the labyrinth and the rocket in space. 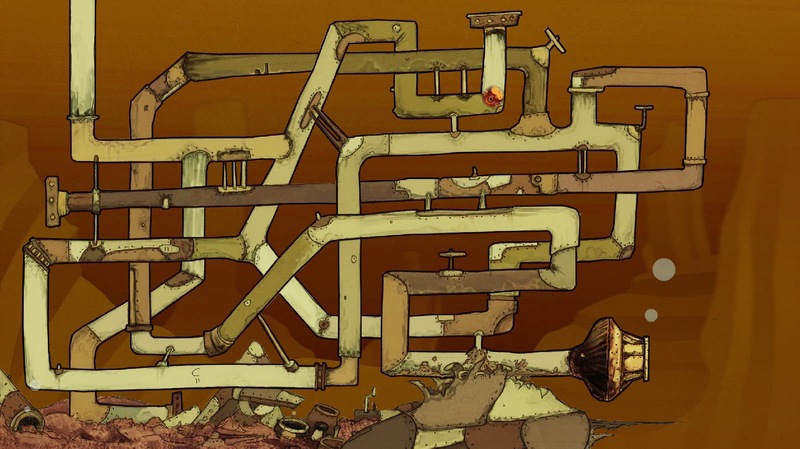 The labyrinth was not that simple, as we needed to put in invisible switches to lock/unlock different paths and make sure that the player icon stayed inside the pipes. The rocket game was more simple to program, but needed the right “feel” when the scrap hit the rocket. As you will crash no matter what, the game is very similar to the popular endless runner games out there. We put in a couple of hearts as stamina so now you can try and see how far you will get before crashing. It is always important to have your product tested early on. This type of product however was a bit difficult to test before the voices were ready, and the scenes were animated and so on. But we should have tested the individual scenes as soon as they were “complete”, instead of waiting for the whole book to be done. As we are nearing the release we finally send out the book to testers. The feedback is very important as testers spot different things than the developers do, since they use the product in a different way. I also started a company. It is possible to release an app in your own name without having a company, but I figured it was best to release the book in a company name since “Sofus and the Moonmachine” is not the last animated or interactive product that I will make. It is easy and fast to make what we call a “one-man-company” in Denmark. Of course, as I am an artist and not a business guy, it took me some time to get into all the “company stuff”, but it was quite simple. The Outer Zone is my company name. The plan is to develop all sorts of things under this name. Games, film and perhaps more interactive books. The Outer Zone will not stay bound to a certain genre, media, platform or age group and the plan is to keep focused on bringing unique experiences rather than commercialized junk. It will work as an output of all the projects I dream of creating. As I also need to make money to pay the rent, it will probably be a side project for a good time. But I will aim to make it my main workstation. I have never designed logos before. It is such a different thing than a background drawing or a character design. I had a lot of complex ideas, but decided to go with a minimalistic and more “classic” logo. Since the logo is simple, I wanted the logo animation to be exploding. It needed to be short, but powerful. So for that I took inspiration in the various 80’ies VHS ident screens I saw as a kid. This overdone flashy retro style goes hand in hand with The Outer Zone. This project drags on, so I hope you will be as patient as we are. 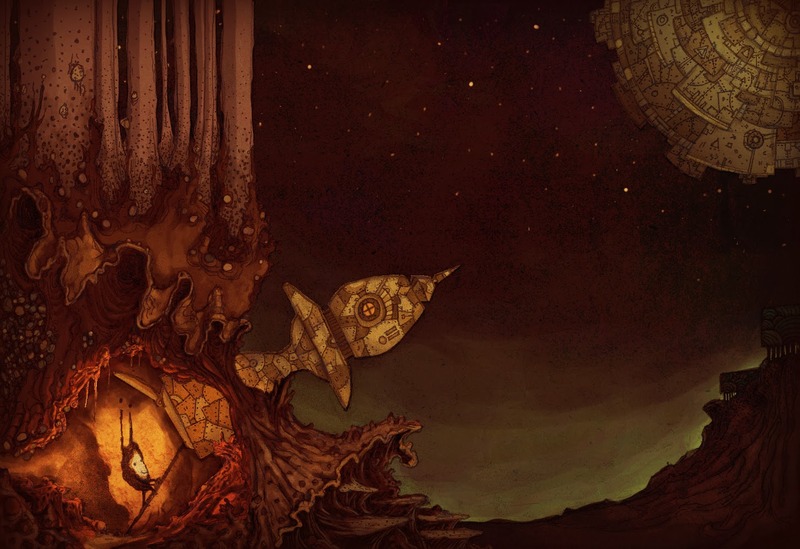 We aimed for a release in 2014, and certainly before Christmas, but fate seems to pull us into the year 2015. We want the book to be as polished and as bug-free as possible, and that, my fellow adventurers, takes a lot of time. So see you next year! The Outer Zone will act as the publisher, and as Apple is distributing the app, I don’t have to collaborate with other companies. This is the good thing about making digital products – you are not restricted by rules from publishers plus you keep all the rights to yourself. Still it would have been nice to collaborate with an experienced marketing company to get the book out to the audience. Doing it via facebook and friends is a very slow process. Promotion is not a simple thing, and it’s also an area in which I lack experience. One thing is to know how to expose your product the best way, another thing is to have the resource to do so. The Outer Zone is a new company and doesn’t have a budget for advertisement. So I have only used free or very cheap ways of getting exposure. One way you can promote for free is to write about the development. I started writing this blog to document the progress of the book, but also to spread the word of its existence. I also shared the progress on various game development forums, to build up hype. I can’t say for sure how much it helped on sales, but I got a lot of views and a good amount of feedback, so it is definitely worth it! Another way of getting some promotion is via affiliates. I tried the affiliate company SteamAds which also worked out well. For promoting a digital project, it's a good thing to have a trailer. I made a teaser trailer a couple of months prior to the release to get people’s attention, and finally made two trailers when the app was released (one long and one short). When I make a trailer, I treat it like a shortfilm, as a trailer must tell a story/concept to the audience. It’s an interesting format which boils the entire piece into a one minute thing. 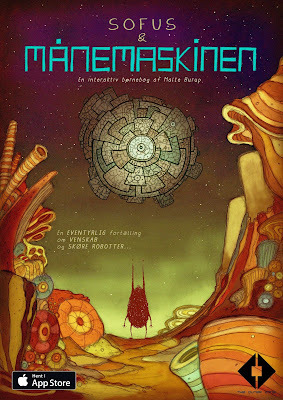 The Moonmachine Teaser Trailer from Malte Burup on Vimeo. Moonmachine Trailer from Malte Burup on Vimeo. When promoting an app, a website is a good link between the costumer and the product. A good idea is to include a good selection of press material and of course a link to AppStore. We kept the website very simple, as a lot of people are passing through to acquire specific information. Designing the icon was a bit of a challenge as I wanted to include Sofus. 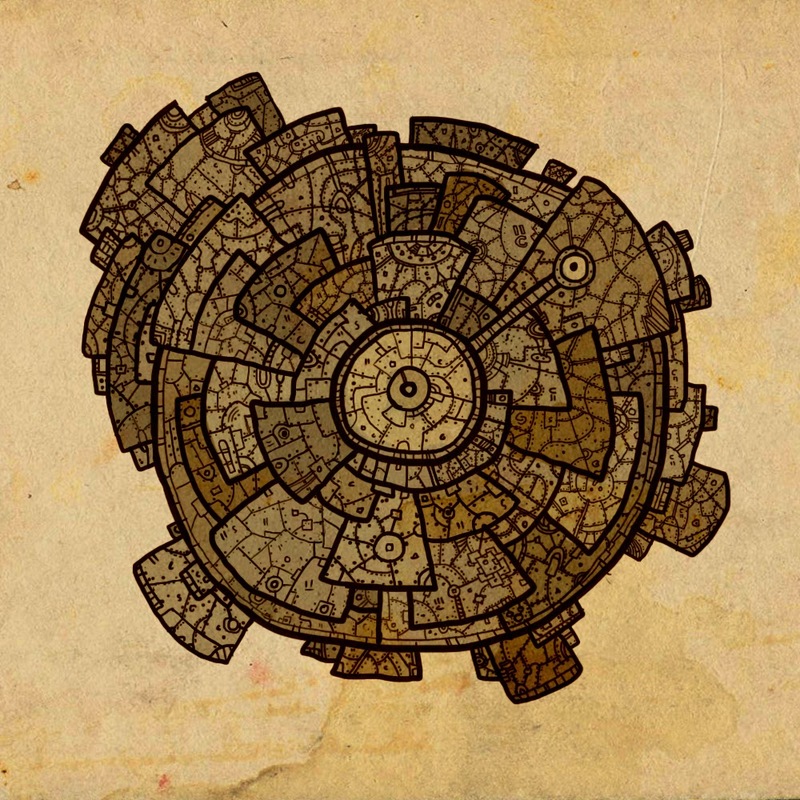 But the design of the little gnorf is tricky to fit into the square format, so I ended up with the Moonmachine as the icon, which is actually better looking, but perhaps not communicating “children’s book”. But the whole idea behind the book is to stand out from the rest, so I guess it’s perfect. I was always looking forward to make the poster for the book, as it sort of encapsulates the entire piece in a single picture. The design of the poster only took about a day, as I already had the idea for the layout. I choose to have Sofus turned away from the audience, looking at the Moonmachine – again to focus on aesthetics and story, rather than a commercial appeal. 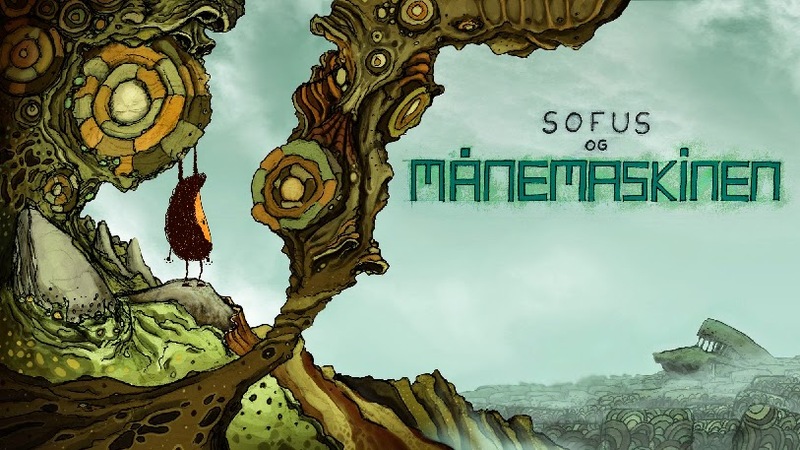 The Danish version of the book “Sofus & Månemaskinen” was released on February 11th following a little release party to celebrate this three-year-long production. It was a strange feeling to set it free like that. Unfortunately you can never fully rest after a release, as the marketing begins right after. Also we have an Android version to produce, bugs to fix along the way and finally there is the English version. The audience reception was perfect. The book might not have reached that many people yet, but it seems like everyone it reached is happy with the result - which is the most important. It received really nice reviews from websites and the Danish press. A lot of reviews praised the fact that the book is different from the rest of the digital children’s books. So I can only state: mission complete! As I am writing this, the sales have reached: 562. This has produced just enough cash to cover the small expenses I had with the production (remember the team worked in our free time with payment being a percentage share of the profit). Reaching the masses takes a big effort, but I hope the sales will rise once I figure out how to reach out to the Danish kindergartens and schools. Creating the book has been a huge experience for me and I have learned so much of all aspects in digital production. I really look forward to see how the English version will be received and I cross my fingers for a possibility to make a sequel or an entire series of Sofus books. 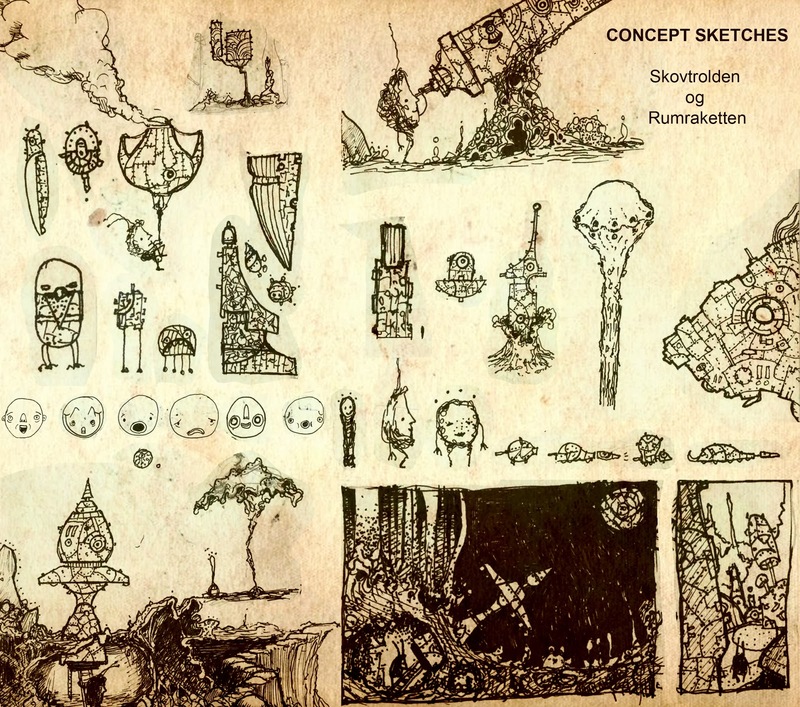 Thank you so much for reading this development blog – I hope you will enjoy Sofus & the Moonmachine as much as I enjoyed making it. Hi Malte, thanks for this fantastic journal of creating your app. I identified with so much of your experience as I also just published my book app The King's Ears, https://rascalmedia.com. I'm going to buy an iTunes card and download your app tomorrow.